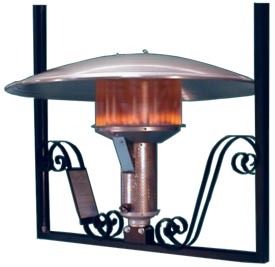 There are four basic models of the Sunglo heater to provide as much flexibility in patio design as possible. For an uncovered patio, the model PSA265 permanent is often the best choice. If the configuration of the patio activity varies, the model A242 offers the convenience and economy of a natural gas patio heater, but the flexibility of a portable heater. The suspended model A244 will heat the patio while leaving the floor free of obstruction. For a completely portable self-contained appliance, the model A270 Propane (LP) heater can be set up outside almost anywhere. For more information on each unit please select a model link to the left.